Drift's native integration with Salesforce is the most extensive for any messaging platform. We know that if you have a Sales team and have reached a certain scale, you're likely using Salesforce. Drift connects your prospects to people in real time through conversation, and you can use all the information captured through your Playbooks and conversations to book more meetings and close more deals! New Contacts from Drift can create a contact record in Salesforce if we can find a suitable account to associate it with. You can choose to allow Drift to create a new contact record even if we can't find a suitable account to associate it with. By default, Drift checks for existing contacts and leads to add conversation and meeting activities to the records of. We also give our customers the ability to always create new Salesforce records. Drift can append the full chat transcript to the lead/contact when their conversation is closed. Set Activity Owner based on which teammate booked the meeting, last ended the conversation, or first participated. Drift will keep your accounts in sync with Salesforce and refresh every 24 hours. Note: Drift ABM is for Company or Enterprise plans with the Clearbit Reveal add-on. Note: When an email is captured in Drift, we will immediately check if there is a matching Salesforce record. If not, we will save that response and update the SFDC card in the sidebar again after 24 hours. To manually refresh that sidebar card, type /sf and refresh your page. For more on the /sf command, skip to "Seeing Salesforce Details in Drift and the Salesforce Shortcut." For more on mapping metrics, check out this doc. We definitely recommend reading the rest of this guide to before trying to utilize the three features listed above. This guide will be a deep dive into the Sync settings and how they work, and you can refer back to these links when you are ready to look at the rest of the integration's features! You must be on one of the following Salesforce Editions in order for this integration to work: Enterprise, Unlimited, Developer, or Performance. This is because the integration requires an Edition with API access; for more info on that, read SFDC documentation here. The Professional edition with API access will also work. You must have the correct User Permissions required by Drift within Salesforce. Please go here for full instructions. To setup the Drift <> Salesforce integration, first navigate to the App Settings within Drift, find the Integrations section, and search for Salesforce. Drift needs specific permissions in order to connect. Without giving Drift these specific permissions, you are almost guaranteed to run into errors trying to connect in the next step. If you skipped past the Requirements section, please go back and read it friends! In this example, we got the error message referencing Contact.LeadSource. 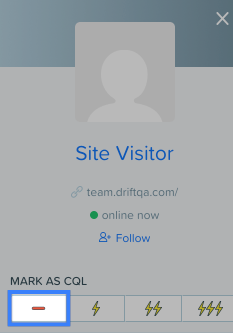 This means that you haven't granted Drift access to the Object Contact or the Lead Source field for contacts. There are a few objects that we need access to; some other examples would be the Account.Name or Opportunity.AccountName. For an extensive list about all of the Object and Field level permissions Drift might use and how to grant them, go here. The integration uses a conversation being "Closed" as a trigger to push information over to SFDC. Make sure to utilize the Auto-Close action in Playbook goals and remember to close your agent conversations with site visitors! See the Technical flow in the next section if you are more curious about this process. Head over to your Settings > App Settings > Integrations > Salesforce > Sync Settings to customize exactly how Drift sends data to SFDC. To configure the way that lead and contact ownership is decided, click the Show advanced settings links. This will bring us to a pretty cool feature in Drift, which is assigning ownership based on context from chat conversations. You can also set a minimum CQL score for contacts and conversations to have before they can be synced over! The user who closed the conversation. If you check more than one, they will be checked in sequential order. Whichever condition is matched first will determine the Owner. You can also see that the mapping conversations to a Salesforce Activity type has a dropdown automatically populated with the Activity Types available in your Salesforce instance. The campaign selected here is the default campaign leads/contacts are attributed to when they are synced from Drift. You can also set campaign attribution at the Playbook level! In order for the Drift <> Salesforce connection to work properly, we need to map the users in Salesforce with the Users in Drift! Routing the correct Lead Owner into a Drift conversation. From the Salesforce Setup Page, select Mapped Salesforce Users. Then connect the dots by selecting the correct SF User and Drift User on the left and right columns. Only one user in Salesforce can be matched to one Drift Teammate at a time. If a Lead, not a Contact, already exists with this email, we will either create a Contact or update the existing Lead based on your Salesforce duplicate setup. See the screenshot below for the checkbox in your settings which will prevent us from checking for an existing contact within your Salesforce instance. Find this toggle in your Sync Settings. Still have questions about duplicates? Here's a Salesforce article on Managing Duplicate Records. To illustrate how this integration will look and works once you've configured all your settings, here's some more details The key components are that you'll be able to see Chat Activity records as Tasks completed in Salesforce, and that in Drift from within the Inbox and Conversations view, there's a shortcut to view Salesforce Account Information. Seeing records for Leads/Contacts which you didn't want to be pushed into Salesforce from Drift? Read on to learn how to prevent visitors you determine are bad leads from being added into your Salesforce instance. You can easily see Salesforce Details for the contact within the conversation! In the sidebar on the right, you'll see a Salesforce Details card with at-a-glance information. If you have Salesforce credentials, the "View in Salesforce" button will take you to the account in Salesforce. It will appear and work functionally as an internal note, so your end user won't see you using this shortcut at all. Additionally, if you want to manually refresh the Salesforce details in the card in the sidebar, refreshing your page after entering this command will populate the information there as well! This will open a new tab, so you won't lose the conversation you were in inside of app.drift.com! Just make sure you are logged into your Salesforce instance in your browser for this direct link to work. That's all! Try testing marking a test visitor as a bad lead and then close the conversation. If you look in the Salesforce Event Log, you should see no lead or contact creation activity on the log for that site visitor, even after you successfully captured their email. How can I check if the integration is working? Which fields can't I map to Salesforce in our field mapping page because of Drift's agreement with Clearbit? Usually, the last name of the prospect is still required for the lead in Drift to be transferred into Salesforce. What if you don't have that and you just have their email when they start a conversation? Good question. With our integration, you don't need a last name for the lead to be passed back. If we don't have a last name, we pass "[ MISSING ]" as the last name. If that is updated at any point in Drift, and the name hasn't changed from "[ MISSING ]" in Salesforce, we update it to the name in Drift. If there is a record associated with a Drift lead's email address in Salesforce -- will it change any attributes on that record in Salesforce? Nope - we currently don't do anything with your existing attributes. Will Drift send previous contacts and conversations to Salesforce once I connect? At the moment, the Drift <> Salesforce connection will only begin syncing lead data from the moment it's connected, forward. What Drift Plan do I need to be on to have access to this integration? The Drift + Salesforce integration is available on our Pro plan and above. Integrations are broken down by plan under our pricing page. What Salesforce Plan do I need to be on to have access to this integration? The Drift + Salesforce integration is available on SFDC's Enterprise, Unlimited, Developer, or Performance editions. You can also use the Professional edition as long as you also have API access included. Can I attribute leads/contacts from an individual Playbook to a specific Salesforce Campaign? Yes! As of February 22nd, you can now automatically attribute new leads/contacts from a Playbook to specific Salesforce Campaigns. The Playbook level campaign will take precedence over the general sync settings' campaign. If there is no campaign selected in the Playbook's settings, leads/contacts will be added to the general sync settings's campaign. Check this doc for more! How do you protect my Salesforce credentials? Your Salesforce tokens are encrypted both at rest and in-transit.